As highly as we Fools think of Warren Buffett and Berkshire Hathaway , we'd be foolish (with a lower-case "f") to believe any company is truly without risk. Over the years, Buffett has largely made his name by identifying stocks whose share prices have lagged the intrinsic value of their underlying businesses. As a result, it should come as no surprise that Buffett believes the best way to measure Berkshire's performance is by calculating its book value. Sure enough, as I noted last month, Buffett himself lamented Berkshire's respectable 2012 book value growth of 14.4% as "subpar" after it fell short of the S&P 500's 16% gain. What's more, while Buffett has helped Berkshire's book value per share rise an astounding 586,817% over the past 48 years (seriously -- that's no typo! ), he readily admits that, with Berkshire's enormous capital base, its book value per share going forward will probably have a hard time increasing "at a rate even close to its past rate." Even if Berkshire's book value per share manages to outpace the broader market's return, you can bet that if the share price lags, many fickle investors still won't be patient enough to wait for the price to catch up with the value of the business. While this isn't necessarily Berkshire's fault, you can bet many investors will inevitably perceive it as a failure. As Peter Lynch once said, "Go for a business that any idiot can run -- because sooner or later, any idiot probably is going to run it." Before you go yelling "Blasphemy!" from the rooftops, I'm all too aware that Berkshire's current management team is as solid as they come. Heck, there are at least six people with whom I wouldn't be surprised should they be chosen as Buffett's eventual successor. Until that time comes, however, nobody can be positive that Berkshire's future management team will be able to even partially replicate the success of the unrivaled team that is Buffett and Charlie Munger. Of course, Buffett has been busy preparing his value-investing proteges in Todd Combs and Ted Weschler to take over the portfolio once he's gone. However, thanks again to Berkshire's enormous size (and much like the management uncertainties I outlined a moment ago), investors won't be able to count on seeing Berkshire achieve these types of incredible equity portfolio returns down the road. Because Berkshire runs enormous insurance operations through its subsidiaries in GEICO, General Re, and Berkshire Hathaway Reinsurance Group, the company is also subject to insurance risks, including natural disasters and acts of terrorism. Putting aside the fact Berkshire has admittedly operated at an underwriting profit for the past 10 consecutive years, if a truly catastrophic event were to occur, Buffett's company would almost certainly feel the hurt. As is the current case with the rest of Berkshire's operations, its non-insurance businesses also seem to be firing on all cylinders as America continues to exit its most recent financial crisis. To be honest, given the enduring nature and diversity of Berkshire's outstanding non-insurance subs, I have a hard time picturing a scenario where any one of these companies could fold; the largest of them are composed of Burlington Northern, metalworking company Iscar, chemical specialist Lubrizol, manufacturing equipment maker Marmon, and MidAmerican Energy. More recently, remember, Buffett acquired 50% of Heinz in a joint deal with investment firm 3G Capital. Even then, we should never say never, right? Should the country once again dive into another brutal recession, Berkshire's non-insurance businesses would at the very least suffer from an earnings standpoint. In the end, given everything Warren Buffett has done to expand Berkshire's businesses and moat, I'm tempted to believe I'm more likely to win the lottery than to actually see Berkshire fail in all these areas simultaneously over the long run. As a result, short of Armageddon or total anarchy, it's a safe bet that Berkshire Hathaway will probably be around for the foreseeable future. The article 6 Ways Berkshire Could Fail originally appeared on Fool.com. Fool contributor Steve Symington has no position in any stocks mentioned. 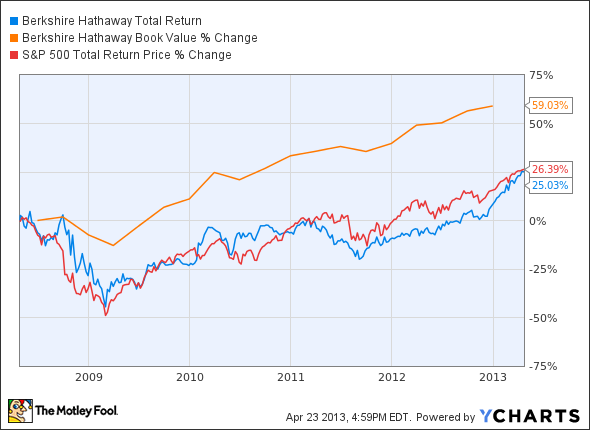 The Motley Fool recommends American Express, Berkshire Hathaway, Coca-Cola, H.J. Heinz, Procter & Gamble, and Wells Fargo and owns shares of Berkshire Hathaway and Wells Fargo. Try any of our Foolish newsletter services free for 30 days. We Fools don't all hold the same opinions, but we all believe that considering a diverse range of insights makes us better investors. The Motley Fool has a disclosure policy.